Well winding down fast now, wow I just seem to get a tag done and time to do another one already. I have to say I have been peeking over at Tim Holtz's blog and said wow to his Tag #10. So today I got out my snowflake embossing folder, some acetate and my CB and cut a tag shape out first then ran it through the CB. I thought it might end up shrinking the acetate a little but it did not so I ended up with the size I started out with. I am new to the Cuttlebug and I am learning so much online from other blogs and peeps who have them. I can't believe the stuff you can do and make with this great little aparatus. Back to the tag.... I recently got some things to make greeting cards from a retailer not far from my home called Ectasy crafts, they sell a lot of Dutch card making supplies and I got some precut sheets that you just punch out and layer it all on paper. 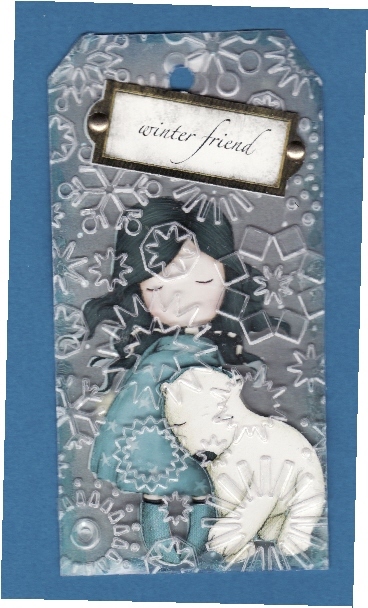 This is part of a card making piece I used, a little girl holding a cute little polar bear. The kit also comes with a sheet of background paper so I cut a tag for the background. I then layered the images on, you have to use a bit of foam tape to make them dimensional but I didn't use too thick a tape because I wanted the acetate piece to fit over top and not be too bulky. I inked the edges with some blue ink on my blending tool then I took the top acetate embossed piece and adhered it all around the edges with glossy accents. Then when it was adhered I then placed my little sign and positioned it first where I wanted it. I punched 2 holes on the card and on either side of the little sign with my 1/8th inch hole punch, adhered the sign with some little bronze brads and that was it. Again simple but so cute. I thought about finding a bit of snow somewhere in my stash but must be down in the basement. Would have been cute to make an almost shaker like tag, hmmmmm might have to work on a shaker for next year. Anyways hope you like it and come back again tomorrow for my last tag. I am so glad some of you have commented and sad to see the end but hey all good things must come to ane end. And......I have decided to give all 12 tags to the winner and I am going to make up a second goody prize for the runner up. Some items for you to make your own tags. Adorable! I have this embossing folder too and was trying to come up with a way to leave some of the embossing out - to better see a face, quote, etc. I may try some foam sheets to try and blank out an area. This little girl & polar bear are just so sweet! Perfect saying too. Thanks for sharing! Well my dearest I can`t comment on all of the different techniques you use as I don`t do this craft, but as I keep telling you..your work is beautiful, imaginative and I would just love to be able to do this! But I will stick to quilting and stain glass. You go girl.